If you’re a large sport organization and you're also licensing out your programs to your training centers', shouldn't one of your goals be to recoup your expenses on the resources invested to create your programs? After all, you’ve dedicated resources, both financial and human, to create those programs, and you deserve to get back what you put in. Those resources likely included various committees and panels of experts to design just the right athlete development model to resonate with your training centers', coaches and athletes. Perhaps you've even invested in an Athlete Development Tracking System and that's costing you out of pocket expenses. To the untrained eye, creating athlete development programs might sound like a quick process, but those that have undertaken it know that it can take years of work to put together a finished product. Not only does it takes years to develop, but the fine-tuning never ends. So when thinking about your financial model, even if you’re a non profit organization, the objective should always be to at least break even, and ultimately to create a sustainable profitable financial model. Non-profit or not, you are still running a business. First thing; don’t sell yourself short. If you create the right value proposition, there’s a way to generate revenue. A financial model is difficult to create if your training centers don't see value in the programs that you offer. One of the ways to test the value is to offer your programs at no cost for a certain period - perhaps even for a full year. This will allow you to evaluate whether the supplementary tools you’ve provided are sufficient and whether your programs need work before you deploy to the masses. As one of your first exercises, do your homework and figure out how many training centers, coaches and participants you have. This will serve as the basis for your financial calculations and ultimately allow you to determine your most viable financial model. This might take some time and effort, especially if you don’t currently have a way track those numbers, but it will pay dividends in the end. This is usually the most "fair" business model, given that it charges for each individual participant utilizing your programs. You can opt to charge only for participants who complete a level, but this might not be the most accurate reflection of people who are using your programs. If there is a significant portion of people who have participated in your programs but have not completed a level, you won’t be compensated for the resources dedicated to providing that service. The biggest challenge with this business model is that it’s difficult to manage, especially if you don’t have the right tools to capture participant information. At Checklick, we provide reports that detail each individual participant's skill evaluation. However, if you’re not using a platform designed to capture this information, it may be difficult to get accurate figures. The second challenge is that it’s difficult to charge upfront unless you deploy a financial model where your training centers can pre-purchase participant credits. Again, a difficult proposition but if you go this route, pre-purchasing credits is the recommended avenue. Get paid upfront! This model is easier to manage than a Per Participant model but can still be challenging depending on the number of coaches per training center that will be evaluating your participants. 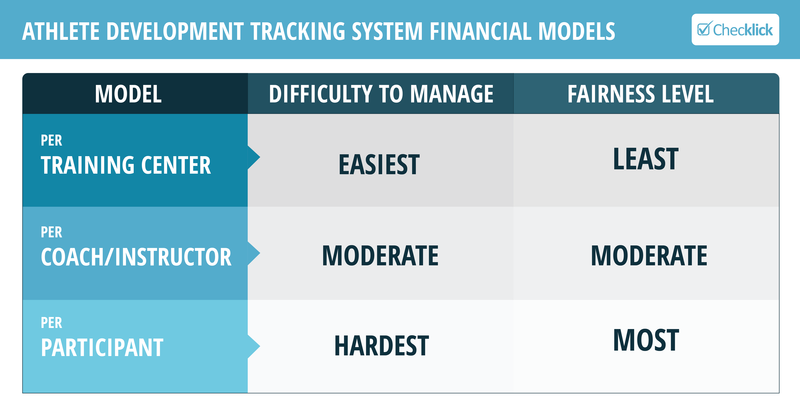 Similar to the Per Participant model, it can be an effective financial model, however, it is also difficult to manage unless you have the tools to capture all the coaches utilizing your program materials. This model is the easier to deploy and manage. As part of the licensing terms, you can determine an upfront price per training center which the training center should be required to pay before using your programs. The most important factor to consider when choosing this model is to ensure that you’ve carefully calculated the average number of coaches and participants going through your programs. For example, if you have a high discrepancy between the average number of participants at each training center, a per training center model might not be your best option. If you assume that 25% of your smallest training centers have on average 15 participants and 25% of your largest have on average 120 participants, a per training center financial model may be out of the price range for that bottom 25% of your training centers. In this example, let's assume that you priced licensing of your programs at $500 annually. The 25% of your smallest training centers would be paying $33.33 per participant and 25% of your largest training centers would be paying $4.17 per participant. This may still be a viable model even given the variance in average costs but it's something to factor into your decision. You can use the spreadsheet in the guidelines below to compare these figures. My suggestion is to first go to this page and download the spreadsheet. In the spreadsheet, enter the number of training centers, coaches and participants. Based on the guidelines below, the spreadsheet will actually calculate the best model for you. Assume you will charge based on the Per Training Center model, since it's easiest to manage. Referring to the Per Participant model in the spreadsheet, if the discrepancy in cost between 25% of your largest and and 25% of your smallest training centers is greater than 400%, consider either the Per Coach or Per Participant model. If the potential overall revenue for the Per Coach Model is within 10% of the Per Participant Model, opt for the Per Coach Model. It's important to note the revenue discrepancy in $ and if you feel that the $ difference in revenues justifies the resources that you'll have to expend to administer the Per Participant Model, you may want to opt for the Per Participant Model. To reiterate the title of this section, what's outlined above is a guideline and might not be the best solution for you, but its purpose is to give you a starting point.